Submitted by Norm Roulet on Thu, 03/02/2006 - 02:54. We all talk about the importance of the creative class and supporting the arts - hopefully we all go to gallery openings every chance we have (future question, how often do you go to openings... feel free to comment) - but artists eat by selling art, not giving away wine. So. when did you last buy a work of local art? Do you push your friends to buy local art? Your business? What artists - who do you like? Plug them - promote some artists... include their URLs if they have websites - add their openings and studio shows to the realneo calendar!!! Submitted by Karen Kilroy on Thu, 03/02/2006 - 09:27. 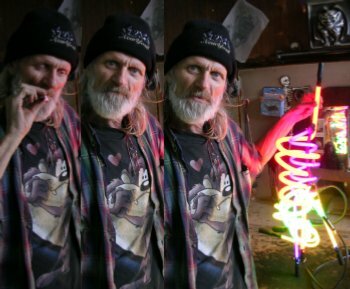 Vince's father is Ray Packard, a well-known Akron artist. Vince has many pieces of art, paintings, sculptures, modified antiques, etc. that you can purchase and display, or he can make custom pieces. Cherokee artist Edwin George's massive mural depicting Ohio animals from a Native American perspective is the backdrop for the Lost Ohio Graveyard - It spans the entire side of the building next door to the graveyard. The mural was painted in 2005. Arabella Proffer-Vendetta very cool artists, cool website too! Submitted by Evelyn Kiefer on Thu, 03/02/2006 - 15:21. Arabella Proffer-Vendetta is a portrait painter who works in the Gothic-Realist style (I made that term up, but it fits) I won't say any more, her website is excellent -- go visit, download some wall paper, commission a portrait or two. Submitted by Susan Miller on Thu, 03/02/2006 - 17:58. 15 artists, three works each (and more in reserve). $200 to $600 with at least one piece by each artist at $200. Through April 15. Gallery hours Wed–Sat, 12–9 pm, Sunday, 1-5. Submitted by Norm Roulet on Fri, 03/17/2006 - 03:40. Submitted by johnmcgovern on Fri, 08/11/2006 - 20:25. Question Of The Day: Knowing This Picture Tells 1,000 Stories, What Does This Picture Tell You About Issue 3?